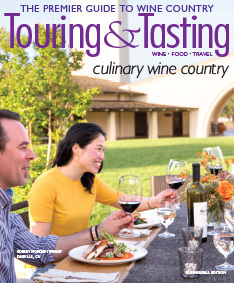 The Summer/Fall 2017 edition of Touring & Tasting magazine is our first Culinary Wine Country edition. We have cooked, sampled, nibbled, and restaurant surfed up and down the mountains, valleys, and shores of the Pacific west, as well as beautiful Traverse City, Michigan to bring this issue oozing with culinary goodness to fruition. Be sure to check out the tantalizing recipes that are mentioned in our special Wine Country Recipes section (p108) and appear on our website at touringandtasting.com/recipes. Grab a fork, a spoon, a pair of chopsticks, and your favorite corkscrew and join us for an unforgettable wine country experience. In keeping with tradition, Santa Maria-style barbecue is a superlative mix of native flavors that pair perfectly with local wines. Follow us and sample, shop, learn about, and savor Livermore Valley's flavors! Oh, the places you’ll go if you’re into ethnic cuisine and find yourself in the Livermore Valley! Who would have thought that you could travel the world without leaving the east bay area? Follow us and sample, shop, learn about, and savor Sonoma County's flavors! The pastures of Sonoma County provide abundant nourishment for its cows, sheep, goats, and buffalo. Their wholesome milk yields a whole lot of artisan cheeses to try.